Penny for the Guy, Mister? Now when did you last see boys, or girls for that matter, out on the streets asking for a “Penny for the Guy”? I suppose with inflation these days they might be suggesting 50p or even £1 for the Guy, but I don’t remember when I last saw youngsters on the streets begging with their effigy, just one more nostalgic pastime from a distant era eliminated. Never mind, you’ll always have persons like myself only too willing to remind you of leaner times and eager to exploit their childhood memories. When I was first old enough to remember participating in bonfire night preparations, some sixty years ago, you’d see kids in the street with all sorts of effigies of the historic rogue, some looking very much like a sack stuffed with newspaper tied round the middle and a Guy Fawkes cardboard mask strapped to the torso with a hastily made “Penny for the Guy” notice scrawled in wax crayon on the back of a cardboard cereal box. Some of the better-made guys were dressed in finer clothing than the scruffy urchins who displayed their works of art, filthy-kneed boys in holed pullovers and scruffy shorts wearing dirty wellingtons. 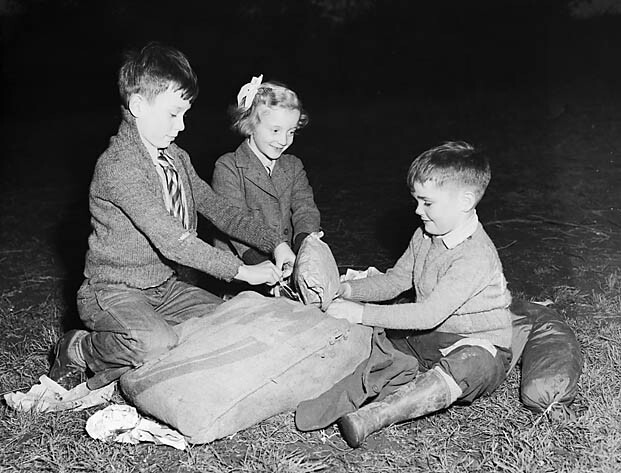 At the other extreme, there’d be boys begging with their masterpieces who were tidily dressed in school shorts or trousers, smart crew-neck pullovers and decent shoes, boys who looked very well-off and I thought would have not needed to beg money for fireworks. 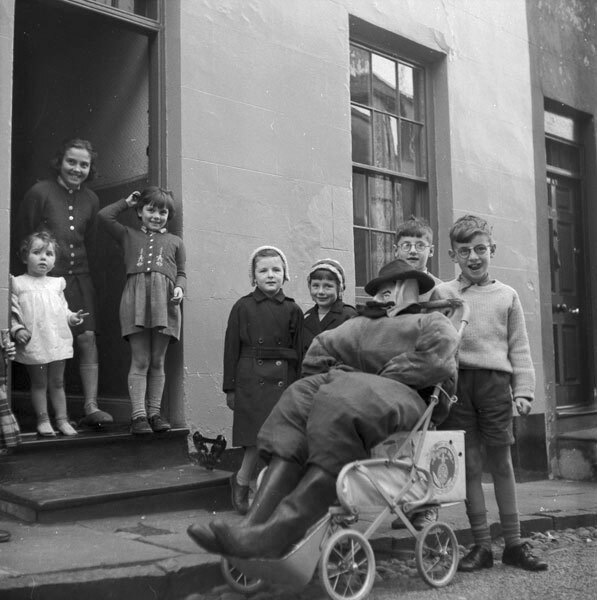 The Saturday before bonfire night was always a time when the youngsters of my era would be out in force on the busy streets of Bridgend, not that I was ever interested or allowed to participate in such activity. There were a few spots favoured by the locals where they might possibly cash in with the passing pedestrian traffic, outside Woolworths in Adare Street was one and the double Caroline Street entrances to the Market were also popular especially if it was raining as you could get under cover there in the wide arched porches that you can see in this 1969 photograph. The days of the old market were numbered when this picture was taken and it was demolished four years later along with all the shops in front; Boots the chemist is on this site now as is the entrance to the Rhiw Arcade. When the day’s begging was nearly over, there would just be enough time to spend the pennies accumulated before the shops closed. In the 50s and early 60s, it was relatively easy for youngsters to get hold of fireworks, I believe the minimum age for purchase was much lower, I think it may have been thirteen but can’t find anything to substantiate that supposition. In any case, it was not unusual to see youngsters coming out of shops clutching bangers or other small fireworks, although I believe the photo of this scruffy young boy in stained short trousers and grubby folded down wellington boots coming out of a shop with an armful of fireworks could have been staged for the camera. 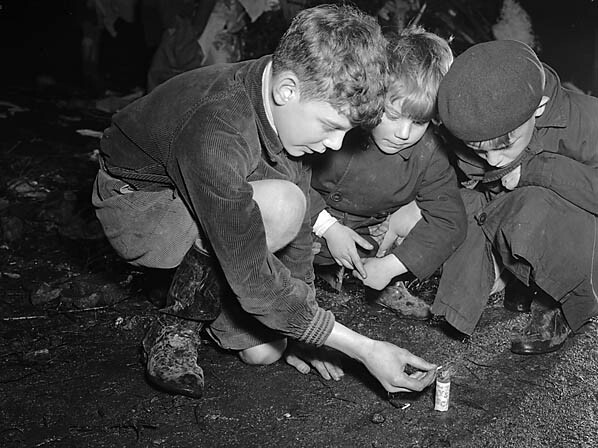 It was common in my younger days for boys to be seen letting off fireworks in public places and at bonfire events although the photo illustrated below was of a slightly earlier period in November 1951. I don’t remember that we spent too much time in obtaining or constructing a Guy for our own celebration. I think our next door neighbours must have provided a Guy as their contribution to bonfire night, as I don’t recall ever making one, but my memory is a little hazy on that point. In my youth I was bonfire-focussed and the burning of an effigy was not foremost in my mind, but we shall return to discuss our bonfire another time. Years later, when I was in my twenties, we made Guys at one of the children’s homes where I worked and what’s more I have photographs to illustrate it. This particular home was out in the country with a few acres of land so it was easy to have our annual bonfire without incurring the wrath of the neighbourhood. In this 1974 picture we see two of our younger lads posing with the Guy which we had sat on an old armchair by the front door. I guess we must have been about ready to go and ignite the poor old thing as Kevin and David look as though they’re dressed ready for our bonfire night. I should have liked to use all my own photographs to illustrate this tale, but as I don’t have many that are suitable or appropriate I have linked to some from the Geoff Charles Collection at the National Library of Wales. Their photographs here are linked directly to their website. Rather funny that you should bring up penny for the guy today as we were just discussing this last night. I did it a couple of times with my friends unbeknownst by my mam she would have been mortified! I would like to thank you for the photos of Tynton farm yesterday, I was born in Pantygog and my mam eventually moved to Llangeinor. Now she told me a little bit about Richard Price but it wasn’t until I came to America that I really learned about what he did. I think that it’s a shame that we never studied about him in school especially being as he was local. I wish that some historical society had purchased the house and made a museum but there we are. Anyway have a safe and happy bonfire night that’s one tradition I do miss! Thanks Helen, the second instalment of this tale will be on 5th November! Yes, sad about the house, but the new owner seems to be very aware of its history and keen to restore it. Very envious of your photographic history Mike, most of mine has been shed amongst a rather large family, I was last in line to inherit. Being the professional pyromaniac, in later years I did experiment with the disection and playing with a rather scarey mixture of weedkiller and sugar with friends, fortunately we survived! Oh, I’ve done the sugar and weedkiller thing in a pantomime I produced in the 1970s, filled the hall with thick smoke so no one could see anything – Health & Safety? not invented back then! Good post and you are absolutely right – kids don’t do ‘penny for the guy’ anymore. I have noticed that more villages now have annual scarecrow competitions during the spring so perhaps this has replaced poor old Guy! There were less controls on fireworks but I remember that we had to get someone’s older brother to buy them for us. Bangers were our favourite and we used to play with them as though we were Clint Eastwood in ‘Where Eagle’s Dare’, throwing them at each other and putting them in milk bottles! – frightening to think now just how dangerous that was! Thanks for the memories. In the weeks before Bonfire or Guy Fawkes’ Night children could be seen on street corners, outside shops, schools, parks and basically everywhere with a crude effigy crying “Penny For the Guy”….then they appeared to disappear or have they? Is it a dying or dead tradition everywhere? This project aims to catalogue sightings. So the intention of this blog is for people to add sightings so that the present survival can be assessed. Is the tradition healthier in the North or the South? What do the Guys look like? How old are the children and so on? That’s why if you see one please make comment on the website http://pixyledpublications.wordpress.com/ all entries gratefully received.